Quantitative Chemistry calculations online Help for problem solving in relative atomic mass calculations. Definitions of relative atomic mass and relative isotopic mass (A level students only) Practice revision questions on working out relative atomic mass from isotopic composition (% isotopes, A level students will learn about very accurate mass spectrometer data). What is relative atomic mass? How do you calculate the relative atomic mass of an element. What is the standard mass unit? Relative atomic mass is explained below, with reference to the carbon-12 atomic mass scale and the relevance of isotopes and 'u' the unified atomic mass unit is explained. Detailed examples of the method of how to calculate relative atomic mass from the isotopic composition are fully explained with reference to the definition of the relative atomic mass of a compound. For A level students, how to define and use relative isotopic masses to calculate relative atomic mass. These notes on defining, explaining and calculating relative atomic mass and defining relative isotopic mass are designed to meet the highest standards of knowledge and understanding required for students/pupils doing GCSE chemistry, IGCSE chemistry, O Level chemistry, KS4 science courses and A Level chemistry courses. or request a type of GCSE calculation not covered? What is the relative atomic mass of an element? What scale is relative atomic mass based on? What is the formula to work out the relative atomic mass of an element? Every atom has its own unique relative atomic mass (RAM) based on a standard comparison or relative scale e.g. it has been based on hydrogen H = 1 amu and oxygen O = 16 amu in the past (amu = relative atomic mass unit). The relative atomic mass of an element takes into account the different masses of the isotopes of that element and the abundance of the isotopes in the naturally occurring element (meaning the percentage of each isotope present). Relative atomic mass is defined and explained below, and examples of how to calculate it from data. The relative atomic mass scale is now based on an isotope of carbon, namely, carbon-12, nuclide symbol , which is given the arbitrary value of 12.0000 amu by international agreement. The unit 'amu' is now being replaced by a lower case u, where u is the symbol for the unified atomic mass unit. 1 u = 1/12th the mass of one atom of the carbon-12 isotope. Note that for the standard nuclide notation, , the top left number is the mass number (12) and the bottom left number is the atomic/proton number (6). ... relative atomic mass equals the average mass of all the atoms in an element compared to 1/12th the mass of a carbon-12 atom (carbon-12 isotope). 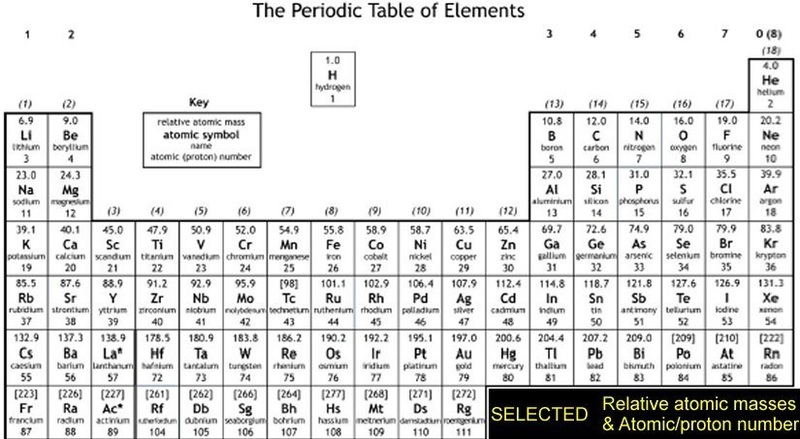 Examples are shown in the Periodic Table diagram above. (i) Because of the presence of neutrons in the nucleus, the relative atomic mass is usually at least double the atomic/proton number because there are usually more neutrons than protons in the nucleus (mass proton = 1, neutron = 1). Just scan the periodic table above and examine the pairs of numbers. You should also notice that generally speaking the numerical difference between the atomic/proton number and the relative atomic mass tends to increase with increasing atomic number. This has consequences for nuclear stability. (ii) For many calculation purposes, relative atomic masses are usually quoted and used at this academic level (GCSE/IGCSE/O level) to zero or one decimal place eg. hydrogen H = 1.008 or ~1; calcium Ca = 40.08 or ~40.0; chlorine Cl = 35.45 ~35.5, copper Cu = 63.55 or ~63.5/64, silver Ag = 107.9 or ~108 etc. At Advanced level, values of relative atomic masses may be quoted to one or two decimal places. Many atomic masses are known to an accuracy of four decimal places, but for some elements, isotopic composition varies depending on the mineralogical source, so four decimal places isn't necessarily more accurate! Note that in the case of carbon, there are three isotopes carbon-12 12C the most abundant and small amounts of carbon-13 13C and carbon-14 14C. The average calculated mass of the atoms compared to carbon 12 is 12.01, but for most purposes at pre-university level, 12.0 is sufficient accuracy. In using the symbol Ar for RAM, you should bear in mind that the letter A on its own usually means the mass number of a particular isotope and amu is the acronym shorthand for atomic mass units. However there are complications due to isotopes and so very accurate atomic masses are never whole integer numbers. Isotopes are atoms of the same element with different masses due to different numbers of neutrons. The very accurate relative atomic mass scale is based on a specific isotope of carbon, carbon-12, 12C = 12.0000 units exactly, for most purposes C = 12 is used for simplicity. For example hydrogen-1, hydrogen-2, and hydrogen-3, are the nuclide notation for the three isotopes of hydrogen, though the vast majority of hydrogen atoms have a mass of 1. When their accurate isotopic masses, and their % abundance are taken into account the average accurate relative mass for hydrogen = 1.008, but for most purposes H = 1 is good enough! The strict definition of relative atomic mass (Ar) is that it equals the average mass of all the isotopic atoms present in the element compared to 1/12th the mass of a carbon-12 atom (relative isotopic mass of 12.0000). So, in calculating relative atomic mass you must take into account the different isotopic masses of the same elements, but also their % abundance in the element. Therefore you need to know the percentage (%) of each isotope of an element in order to accurately calculate the element's relative atomic mass. For approximate calculations of relative atomic mass you can just use the mass numbers of the isotopes, which are obviously all integers ('whole numbers'!) e.g. in the two calculations below. To the nearest whole number, isotopic mass = mass number for a specific isotope. If an element only has one isotope, relative atomic mass = mass of this isotope. A good example is fluorine. All fluorine atoms have a mass of 19 (19F), therefore its relative atomic mass is 19 and no calculation is needed. How do I calculate relative atomic mass? For accurate chemical calculations relative atomic mass must be used and not an individual mass number. Therefore relative atomic mass takes into account all the different 'stable' isotopes of an element which are naturally present. The relative atomic mass is the average mass and is quite easily calculated from the percentage composition (% abundance). The presence of isotopes accounts for why some relative atomic masses are not even close to a whole number. Some relative atomic masses are nearly whole numbers due to coincidence of % isotopes, others because one isotope might dominate the composition with only tiny amounts of lighter or heavier isotopes. bromine consists of two isotopes, 50% 79Br and 50% 81Br, calculate the Ar of bromine from the mass numbers (top left numbers). Note the full working shown. Yes, ok, you can do it in your head BUT many students ignore the %'s and just average all the isotopic masses (mass numbers) given, in this case bromine-79 and bromine-81. The element bromine is the only case I know where averaging the isotopic masses actually works! so beware! ... again think of the data based on 100 atoms, so 75 have a mass of 35 and 25 atoms have a mass of 37. Note: 35Cl and 37Cl are the most common isotopes of chlorine, but, there are tiny percentages of other chlorine isotopes which are usually ignored at GCSE/IGCSE and Advanced GCE AS/A2 A level. Still think in terms of 100 atoms and don't be put off by decimal fractions, it still works out correctly because 69.2 + 30.8 = 100! Calculate the relative atomic mass of silver. Calculate the relative atomic mass of europium. Example 1.6: Atoms of the element silicon consist of 92.2% silicon-28, 4.7% silicon-29 and 3.1% of silicon-30. Calculate the relative atomic mass of silicon. See below and mass Spectrometer and isotope analysis on the GCSE-Advanced A Level (basic) Atomic Structure Notes, with further relative atomic mass calculations. This definition of relative isotopic mass is a completely different from the definition of relative atomic mass, except both are based on the same international standard of atomic mass i.e. 1 unit (1 u) = 1/12th the mass of a carbon-12 isotope (12C). See also Mass Spectrometer and isotope analysis on the GCSE-AS(basic) Atomic Structure Notes, with further RAM calculations. It is possible to do the reverse of a relative atomic mass calculation if you know the Ar and which isotopes are present. It involves a little bit of arithmetical algebra. The relative atomic mass of boron was obtained accurately in the past from chemical analysis of reacting masses but now mass spectrometers can sort out all of the isotopes present and their relative abundance. Notes: (i) The list of relative atomic mass are in alphabetical order by element name, together with chemical symbol and proton/atomic number. (ii) The relative atomic masses are quoted to two decimal places, though it is essential to be aware that values in pre-university examinations might be rounded to the nearest integer or one decimal place. 14.4 water of crystallisation calculation 14.5 how much of a reactant is needed?